Austin.com Aus10™ Live: 10 Bands You'll Get Addicted To This Weekend! Aus10™ Live: 10 Bands You’ll Get Addicted To This Weekend! Local indie artist Walker Lukens releases his new EP Never Understood today and will be celebrating it with an in store at Austin’s favorite record shop, Waterloo Records. Playing new songs from the EP should be a good time, so due to the store’s small capacity, we encourage you to get there early. 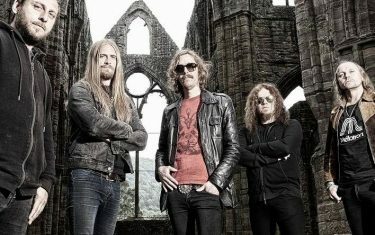 Formed in Sweden in 1989, Opeth has becoming a driving force in the heavy metal scene for their long and ambitious songs that incorporate jazz, blues, and other genres to create a new sound that is unheard of. With tracks such as “The Wilde Flowers,” Opeth sounds like no other metal band, so head down to Emo’s this weekend and check them out. Mastering drums, piano, and guitar at a young age is no easy task for anyone, but musician Connor Schatzel has managed to do just that. Incorporating electronic sounds into his music, Lumberjvck, which is his stage name, creates funky and moody tracks that electronic fans will love. If you are looking to get your weekend pumping, then Scratchouse is the right place to be this weekend. Local act the Mystery Achievement will be performing at the Swan Dive this weekend performing their goth and rock and roll inspired tunes that will get your weekend started off the right way. With songs such “Weird Mofo,” you’ll be addicted from the moment you start listening. Indie rock band The Faint is coming back to Emo’s this weekend to perform their energetic songs that will get you ready to enjoy the rest of the weekend. With interesting tracks such as “Agenda Suicide,” we love The Faint’s sound and we know that you will too. Having two birthday bashes in Texas every year, Jerry Jeff Walker is definitely a celebrated music figure in The Lone Star State and he is coming to ACL Live this weekend to perform some of his hits and fan favorites. If you haven’t heard any of his songs before, listen to “LA Freeway” below to hear what he sounds like. Brooklyn band Dreamers will be coming through Austin this weekend to support their new record This Album Does Not Exist. With fantastic energy and catchy songs, you will not want to miss this infectious act, so you should get your tickets as soon as possible. With electronic sounds like sound like something from the 80’s, electronic music fans will dig Magic Swords bumping tunes that bring a fresh perspective to the popular genre. Listen to their track “Uprising” below. Longtime country singer Toby Keith will be performing at Austin360 Amphitheatre this weekend and with 17 albums of material to choose from, he will have the crowd dancing all night long. With a great voice and live show, we can’t recommend anyone better than Keith if you are a country fan. Meeting at the University of Toronto in 2011, R&B duo Majid Jordan is comprised of Majid Al Maskati and record producer Jordan Ullman. With catchy tracks such as “Small Talk,” this Canadian act is guaranteed to light Emo’s on fire with their sizzling beats. If you would like to read more of Lauren Gribble’s features, you can head to her website Listen Here Reviews.